New Year reminders for the US Power Squadron. 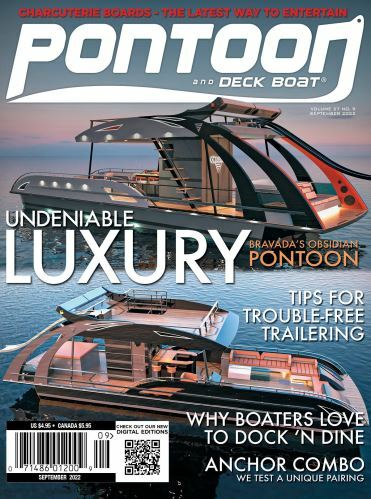 In our What Lies Beneath series, we have closely examined some of the ingenious innovations that have brought pontoon boat building from its humble infancy to the titan of ingenuity and first-class seafaring found today. For the second portion of “What Lies Beneath”, we'll explore some of the construction methods of the hull, seating, bulkheads and other aspects of manufacturing that go into making the pontoon boat. When you spend a lot of time on the water, you start to notice some of the things that the new guys never see. With Christmas behind us and boat show season straight ahead, there is something to consider once the shopping, drooling and deal making slows down and you pick out your new boat for the new season. Who’s that peacefully chartering along at a pace that unfurls the beautiful scenery like a painted Asian scroll? No, who’s that twisting figure eights around the swell heads? Are underwater and under-deck lights still a fad? I guess I might be late on this, but I finally added a couple of blue LED lights to the engine pod of my ‘toon. Our 2019 Shootout Boat Test issue will start hitting newsstands and mailboxes the first week in January, but for a sneak peek check out the videos of these new models. Barletta Pontoon Boats, located in Bristol, Ind., has met and exceeded their company goal of building and shipping one-thousand pontoon boats in their inaugural year of production. The new personal solar charging mobile device from SOUL Inventions is sure to be the next hot accessory for boaters this spring. We put together these solid tips on how to make the most out of your day on the water by planning ahead. You can’t help but be drawn to this boat. From the use of fiberglass and sport arch to the inviting plush interior and added key features, this Berkshire has a lot going for it. BoatUS has decoded the most popular boat names, revealing a list of the Top 10 Boat Names of 2018. Still need an idea for a Christmas gift? If you haven’t checked out radio-controlled boats and vehicles in awhile, you need to see what you’re missing. Looking For Clean & Powerful? Pure Watercraft announced today the launch of the most energy dense battery pack available in marine propulsion. Hurricane Australia, importer of the US-built Hurricane fiberglass pontoons, has expanded its local offering with the addition of the Sweetwater, Sanpan and Aqua Patio ranges from the same builder, Godfrey Marine. This beautiful boat is eye-catching to say the least. Only eight months after breaking ground, Mercury Marine has officially opened a new state-of-the-art expansion at its global headquarters in Fond du Lac, Wis. Theft of helm electronics and outboard engines is skyrocketing so the South Florida Marina & Boat Watch Group page on Facebook was created to help fellow boaters. We found a lot of added value in this Lowe Retreat that is going to appeal to a lot of families—as well as a lot of budgets. What do you get a boater for the holidays? How about providing some much needed on-water and on-road help – including free tows back to his or her home dock – in case of a breakdown?